What is the difference between die cutting and embossing? Die cutting and embossing are two techniques of embellishments used in marketing materials that you see every day to add personality to the printed piece. 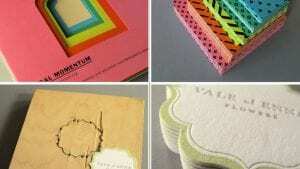 They give a “wow factor” to advertisements, invitations, business cards and much more! If you are looking to catch your customer’s eye and stand out from competitors with a memorable first impression, we will outline how both die cutting and embossing can help do just that. Simply put, die cutting refers to the art of cutting out intricate shapes in one fell swoop, with the use of metal cutting shapes called dies. Think cookie cutters for paper! Household items, office supplies and brand packaging to electrical gadgets, IT hardware and complex engineering equipment; die cuts are used to mass-produce the countless objects which make our lives more convenient. But that’s not all – because dies eradicate the need for scissors when it comes to creating cut paper shapes, the opportunities to produce stunningly intricate designs are almost limitless! For example, a coffee shop can give their brochures a beautiful and unique touch by creating them into the shape of a coffee mug! Die cuts are pre-designed steel casts which are used to cut patterns into thin pieces of material, such as metal, fabric, wood or plastic, in order to create a specific uniform shape. Once the die cut shapes (often referred to as ‘blanks’) are produced, they then go on to be decorated and integrated with other design components. An object usually has several die cut elements, which need to be assembled together in order to create a finished product. What does the die cutting process involve? Die cutting involves using specially positioned blades mounted on a strong backing and constructed into a pre-determined form, to cut patterns and shapes into a material. The mounted steel blades are pressed onto the material in order to cut the required shapes. For efficiency, the die may cut through several layers of material at once, producing a stack of blanks, or multiple dies that may be fitted together on a large mount to create a higher volume of blanks with just one press. Die cutting is a highly skilled, meticulous task that requires a great deal of attention to detail and expert knowledge. Another simple and creative technique that can be applied in many different ways is embossing. In the printing industry, embossing refers to a method of pressing an image into paper or cardstock to create a three dimensional, raised surface with the design higher than the surrounding paper area. Text, logos and other images can all be formed by the embossing method. To emboss, a commercial printing company uses two main things: a die, which is a personalized, custom metal plate that is cut into the image you want to emboss, and paper. The process involves two metal dies, one with a raised surface and the other with a mating surface recessed into it. The die presses into the stock like a stamp and slightly raises images off the paper of your printed piece. Similar to being pressed by an iron, the paper fibers permanently reshape to take on the intended design. The result is a 3D effect that emphasizes certain areas of your design. Often times you will see this applied in a company logo, a custom illustration, initials, or on a pattern for a more luxurious effect. A similar but less common technique is debossing, which is almost like the opposite and results in a depressed surface, with the design lower than the surrounding paper area. Embossing provides a look of high quality and elegance. You will often see embossing on printed pieces that aim to impress, like presentation folders, business cards, invitations, certificates, brochure covers. Embossing can create additional distinction when used in conjunction with metallic foil or a spot UV coating. The image area can also be pre-printed before being embossed to provide an interesting 3D effect. Both die cutting and embossing are popular print effects and are ideal for giving your print piece a fresh, contemporary look – and when combined with other effects, like foil stamping, they can transform a great piece to a luxury one. We here at Davant are ready to help you pair the perfect printing effects with your marketing materials! Send us a message, or give us a call at (317) 849-6565.